I told you snow hates me. The storm has dumped snow all along I-95, which is of course the route to the beach. I know the decision to leave tomorrow is for the best. And on the bright side, we are getting to play some games and just relax at home. But still. If it weren't for snow, we'd be on our way to the beach. I hope you are having a very Merry Christmas with all your loved ones. I am heading to the beach for the new year and will likely not have internet access. So I hope you have the best of holidays and I will see you in 2011! I have completed my last days of Estonian language training at the Foreign Service Institute until after the New Year (not including self-study, of course). The shopping is done. The wrapping is done. So I am spending Christmas eve hanging out with my wife and our critters, playing video games and just relaxing. Tomorrow we will head up to my in-laws for Christmas day. Then Sunday, we head to the beach for a week. I hope whereever you are this holiday season, you and those you love are happy, healthy and together. I don't think it is any secret that I am not a big fan of snow. I used to be. Of course, coming from the South, "snow" was the 2 or so inches we got every 3-4 years. Then I moved to Syracuse. And they have an annual snowfall greater than my height. So I got to like it less. I liked it a little better when I was in Chapel Hill...we got 20 inches in one storm and it was pretty awesome. Then we had a snow and ice storm, and I disliked it again. We were without power for weeks (and because we were on a well, also without water...good times), but luckily my department at UNC allowed us to sleep in the lab...with my pets (archaeology department at UNC seriously rocks!). Last year's snows in DC didn't help me like snow any better...when our roof people finally shovelled it off our roof (all like four feet of it), they dumped it on our stairs. And created an ice ramp that I had to try to shovel footholds into while in my work clothes so I could get into my house, change clothes and shovel the steps. But we had snow last week, and I thought, well that is pretty. I can deal with that. I will think positively so I will be happier with the weather in Estonia. Now I am positive snow hates me. Because they are calling for a possible white Christmas. Which WOULD be awesome. I have never had one. I once drove two hours to get to a place on Christmas morning where there was snow. That is the closet I've come. So like I said, that WOULD be awesome. We are supposed to drive to the inlaws' Christmas morning. 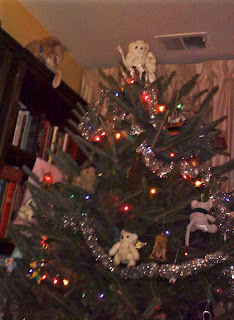 And back home Christmas evening. So we can drive to the beach the day after Christmas. And have a much needed break, especially after the last few weeks. That much driving is fine...without snow. And they are calling for EITHER snow showers OR a big storm. 50-50 shot. Awesome. A great few days...so why the hell haven't I written? I have really had a great few days. This weekend, I finally got a letter from the grad school. They approved me for a one semester extension to finish my dissertation. They said they don't approve those extensions lightly, but given my extenuating circumstances (my service and my grandmother's death and having to handle her estate) plus strong support from my department, they were willing to approve it. So I have one last chance to finish my PhD. And I really want to finish. Then Saturday, my wife and I did some running around, including a trip to the animal shelter. Our older cat passed away two weeks ago, and we have been thinking of getting another cat. Not to replace her, because that isn't possible. We are still both terribly sad. But we also feel that we know we can take care of two cats and there are lots of cats that need homes. Saturday evening, the Senate voted to repeal Don't Ask, Don't Tell. There is still some implementing to be done, but finally we can see a day when, like LGBT Foreign Service Officers, Gays and Lesbians will be able to serve openly in the military. Hoorah! Saturday night, I went to the GLIFAA party, though only briefly. I didn't really feel up to it (I'm getting a sore throat), but my teacher said she might go (at my invitation), so I felt like I had to. I didn't stay long, but I was glad to see a good turnout. Sunday, we went back to the shelter and looked at some more cats. This time, we found a little guy we liked. He is a seven month old kitten with black and white medium length fur. We picked him up today. Of course, introducing a new cat is always challenging, but I think the pets will sort thinks out. He already showing signs of being a good traveller, a must for a DiploCat. And today, we had our Christmas party for the Nordic languages and Greek. We did a presentation which was basically a quiz about Estonian Christmas traditions. We translated the questions into Estonian before letting the audience translate. While there were other presentations that were fancier or seemed better orchestrated, I was proud of us. We were the only language group NOT to read their parts. And what we said wasn't memorized. We just translated. So, I think our presentation demonstrated that we are getting a handle on the language. And I was pretty proud of that. I can not confirm whether this is really a State Department cable, but I share this alleged cable with you because this is clearly information the public needs to know! (and no, I didn't write it, nor do I know who the author is or whether this is really a State Department cable). (SU/NF) Claus dominates the political and economic life of one of the world’s most isolated societies. Communication with the outside world is limited to one delivery of mail each year (mid-December, incoming only). Claus is the only citizen permitted to travel, and he only leaves North Pole once each year. Perhaps in an indication of concerns about personal security we note that Claus ALWAYS travels at night, and never publishes his itinerary. who’s naughty and nice.” And then, a threat: “You better not pout, you better not cry.” Claus himself reportedly checks the enemies list… twice. (SU/NF) Claus has reportedly surrounded himself with a small group of sycophantic advisors. We hear from contacts that no dissent is tolerated. Claus’s wife (Mrs. Claus) is widely seen as “the real power behind the toy bag.” Also influential is a my sterious figure referred to only by his first name: Rudolf. Claus frequently seeks “guidance” from this person. Post has not had contact with him, but the name does raise the prospect of Russian influence. Other influential advisors reportedly include staffers named Donner and Prancer. Claus’s relationship with an aide nick-named “Vixen” has raised eyebrows in conservative, traditional North Pole society and has caused unsubstantiated rumors of personal indiscretion. observers note that Claus is almost constantly giggling: One contact notes: “He has a broad face and a little round belly that shakes when he laughs like a bowlful of jelly.” Another observer told us: “His eyes-how they twinkled! His dimples were merry. His cheeks were like roses, his nose like a cherry. His droll little mouth was drawn up like a bow. And the beard of his chin was as white as the snow.” Our DEA office note that Claus and his inner circle seem to have developed a sophisticated global shipment network that allows for clandestine delivery of packages. They also note that Claus and his advisors are frequently overheard discussing “snow” and “ice” and “candy.” Clearly, the rumors of drug abuse have to be given some credence. (SU/NF) Claus’s views on environmental issues are nuanced: for obvious reasons he is deeply concerned about global warming, but he has not been a strong supporter of CITES and other efforts to protect endangered species. He is clearly not fond of Polar Bears, quipping to the press that “Those damn bears are always trying to eat the elves” and that if it was up to him, “they’d be a whole lot more endangered.” Claus does, however, seem quite fond of Reindeer. And Post believes we can count on North Pole support for our efforts to save the whales. Claus has no strong feelings on Cetaceans, but we hear that he has a long-standing grudge against Iceland (a whaling country). This is apparently related to a 1979 episode in which a bouncer at a Reykjavik night club denied Mr. Claus and his elf entourage access, and made disparaging comments about both their attire and their physiques. Today was a great day at FSI. I was in language training alone today because one of my classmates is sick and the other may or may not be having her baby. While being alone in class is exhausting, today just felt great! I was able to work on stuff I needed, plus we talked a lot abut all kinds of things (like my complex family!) and used very little English. I even commented that I felt like I did better alone...my teacher said I seemed calmer. Weird. We had the DCMs from the Estonian, Latvian and Lithuanian embassies here in DC come talk to us. It was great to listen to people with real, current experience in the countries we are heading to. It was interesting and useful. Which area studies unfortunately almost never is. Of course, some people might also say today's snow would add to the awesomeness of the day...I am not one of them. My teacher said "Yay!" and I said "Ei" (Estonian for no, and it rhymes with yay). 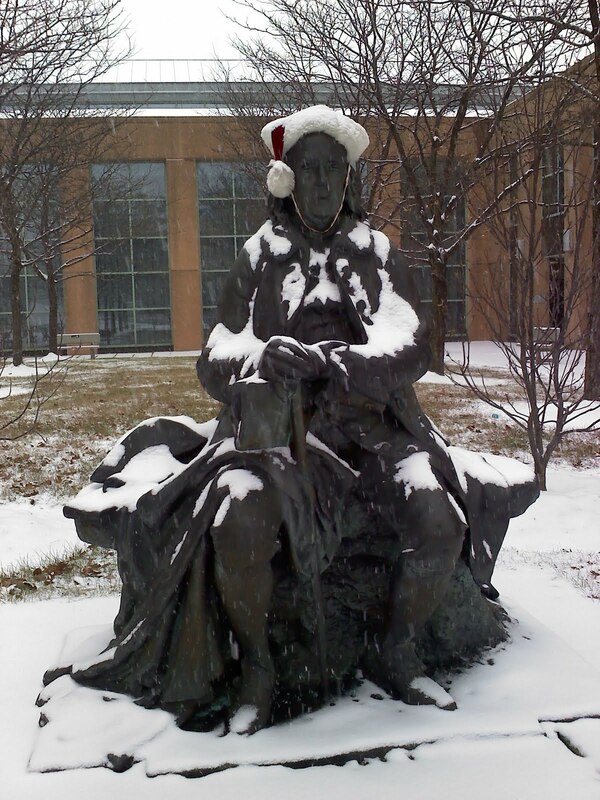 I think poor Ben was pretty cold too, though at least he is in the spirit with his Santa hat. So we have a party coming up. It is a party for all the folks under our LTS. So it is students and teachers in the Nordic languages, Estonian, and Greek. We are all supposed to bring a dish from our country. Have I mentioned I don't cook? So I am hunting for recipes for Estonian Christmas foods...sadly, it looks like I will need to cook, since there aren't any Estonian grocery stores around here. My apologies in advance to everyone who has to eat it. I am leaning towards cheese crisps, only because they seem really easy. Plus I like cheese. We also have to do some sort of performance in our language. So I got back to class today. Luckily, my day off didn't make me too rusty...though I worry what the holidays will do! Because I was in South Carolina and didn't manage to hear much in the way of non-local news, I didn't have much to write about for my daily news assignment. So I just wrote about my trip, trying to use the from and to cases we have been practicing. You know...I drove from the party to the house. Those directions are indicated by word endings (ah, cases...). I capped it off by saying we came home to discover the cat had been sleeping IN the tree. My classmate said, did you mean UNDER the tree? No, not under, IN the tree. My teacher asked, did you mean ON TOP OF the tree? No, no, I meant IN. The cat slept IN the tree. The bottom branches are a bit lower than when we left. Bets on how long the tree remains vertical? About the only news of any non-local sort I heard during my trip to SC was of Richard Holbrooke's aortic tear and his subsequent death. I was sorry to hear of his passing. I will be missing class on Monday. It will be my first absence since language training began back in September. In fact, it is my first missed day of work since my ceiling collapsed in July. I have a good reason. My Dad's family is having their Christmas celebration this weekend, and I am driving down today to see him. I don't get to see him often, and I really look forward to seeing him and my family. As I was drifting off to sleep last night, I was thinking about what I needed to do this morning to get ready to leave. And suddenly I had a pang of, I don't know, disappointment. I was sad that I will miss class on Monday. I am glad we have holidays coming up, but I won't be missing any instruction on those days. Class will go on without me Monday...and I will miss it. How cool is that? I am a little sad about missing something they PAY me to do. Seriously loving my job right now. So on Fridays, we always talk about what was discussed (or not) in area studies. Suffice it to say, I now have the phrase for useless. But since the first part of yesterday's class was useful (at least to those headed to Ukraine), our teacher asked us to talk about what was said in that part of area studies. I told her about how he had talked about problems with the environment. One of the problems I mentioned was that there was a lot of rural development without much thought given to HOW the development was done, and there are lots of tourists going to those areas. She asked why tourists were a problem. I wanted to say that part of the problem was pollution. But we don't have that word. I don't even know the word for air. But I today I was making a real effort not to ask for things in English. So I said it was like bad things in the sky. Struggle, struggle...ah...like bad things in the sky...from factories! And she understood...and gave us the word for pollution. I was very pleased with myself (stop laughing). It is all about the little victories. Whistleblowers don't threaten to release more sensative information if their leader is arrested on completely separate charges. And Whistleblowers don't attack the livelihoods of businesses who don't want to be associated with them. Let me say first that the idea of area studies is a great one. Awesome. Vital. But it just seldom translates to that in reality. Last week, our area studies class was cancelled. Apparently there was a death in the family of our speaker, and no time to reschedule. That said, there was NEVER a noticed up saying what that week's program was and where it was to be held. So I suspect they knew early on that it was cancelled, and never bothered to let us know. I had to hunt down the info on Thursday afternoon. So we actually had class today. But once again, our speaker knew next to nothing about the area we were going to. Our area studies professor is an expert on one of the five countries we cover in area studies, and our classes and speakers lean hard towards that country. So today's lecturer spoke knoweldgibly about that one country and had nothing really for the rest of us. He read some stuff from the computer, and made a couple comments...that were wrong. I am interested. I WANT to know more about where I am going. I think it is really important. But only about two classes so far have been useful. Really annoying. We also found out today that our professor has decided to retire. Next week, we have breakout sessions (hooray! 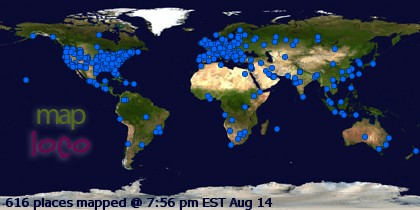 We'll have folks from our countries to talk to! ), and he is going off campus for one of them. Starting in the new year, we will have a new instructor. We have had our new instructor speak to us already. He knows a lot, particularly about our countries. But he thinks he knows everything. And that he is smarter than everyone else. And he is very dismissive of folks in the government, because they are all clearly too stupid to never listen to him. Even so, our first hour of class is my favorite. I like talking about issues and such in Estonian. I think it is fun. Go ahead and insert your insult of choice. Yeah, I have a perverted idea of fun. Yes, I am a nerd. Have you looked around at the other Foreign Service Officers? These are my people. So I was surprised when there was a knock on our classroom door. I sit closest to the door, so I opened it. I expected it to be our LTS...she is the only one who ever interrupts us, and even she very rarely does it. But it was not her. It was a man wearing a red hat. No, it wasn't Santa (I'm disappointed too). He said, "You have to go now." No, I don't have a problem with authority. Why do you ask? He said, "You must leave." It was then that my more observant classmate noticed the fire alarm was going off...though not in our hallway. So I look back at the red-hatted guy, and notice his hat says "warden." Well that would have helped to know. "Is this a drill or a real fire?" 'Cause I'll lug my books if the fire is real, but I only want my coat if it is just a drill. "You have to go!" And he runs away to the next classroom. This is the part where I tell you I am going to die in Estonia. Because it was frickin' COLD outside today (...at least it wasn't raining)! Even our teacher went to get her coat. We all stood around in the courtyard waiting to get the signal to go back in. At one point, they yelled at us to be at least 50 ft from the building. How far is 50 ft? And is 50 ft from F Building too close to the cafeteria? We never did find our teacher...turns our she went out the back of the building after going upstairs for her coat...she said she needed her coat since she didn't have her swimsuit. Yep, I'm gonna freeze to death in Estonia. In case you think Foreign Service Officers are among the "overpaid" federal employees, you should check out this post by Four Globetrotters. "This was seven years ago this month, and time has made it easier to deal with what was ultimately diagnosed as PTSD. I still have nightmares sometimes. But I would do it all over again. One of the things I took from ConGen training was the following: "There is no substitute for personal appearance." This means that when at all possible, we need to be physically present to help our American citizens in their time of need. Whether that's going down to do a jail visit, or helping an Amcit file a police report for a stolen passport, or identifying their remains and notifying their families, when at all possible, do it in person. My story is only one of many. My colleagues around the world have many similar stories to share. I couldn't even imagine what it must have been like in Haiti earlier this year. But we do it, because we love our country and we take our responsibilities seriously. The vast majority of us are highly educated, intelligent, dedicated professionals. Sure there are things that can be improved. That's the case with any organization. But overpaid? I think not." She, and nearly all Foreign Service Officers, could make far more than they are paid to serve you, and they are worth every penny. Today is the 93rd anniversary of Finland's independence. 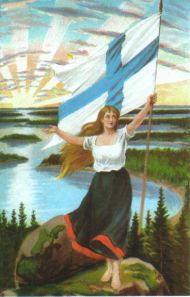 Following revolution in Russia, Finland declared its independence from Russia on December 6, 1917. To celebrate, the Finnish language section at FSI had a party and invited folks from the other Nordic language programs. So we represented Estonia. Their class did a good job with the program...I will just assume their Finnish-language presentations were spot on. And I hope they will give us the same benefit of the doubt when we do ours for Estonian Independence Day (there are two of them actually...February 24 and August 20). Like us, they will probably be able to understand a handful of words. They also provided a sampling of Finnish foods...good stuff! I was brave and tried two forms of herring, one with potatoes and one without. Both were pretty good! Who knew I'd like it? Seems like when the economy is bad, federal workers are some of the first targets Congress and the general public take aim at. You know the story...we are all overpaid and lazy. And when the economy was great, we were told how stupid we were for serving the country at a much lower salary than we could make in the private section. But now that the economy has turned south, everyone is all about freezing our pay so we can share in the pain. There was a great letter to the editor by a federal worker who said she looked forward to sharing in the bonuses all the private sector folks will get once the economy recovers. There was a also good article in the Post today about Five Myths about Federal Workers. They are myths that really need debunking. Myths like that we are overpaid compared with the private sector. "federal employees make on average 24 percent less than their private-sector counterparts. The Congressional Research Service reported in 2009 that private industry pays higher salaries than the government for PhD-level employees in computer science, information science, mathematics, statistics, biological sciences, environmental life sciences, chemistry, economics, and civil, architectural, electrical and computer engineering. In addition, the average private-sector salary in 2010 for a recent college graduate was $48,661. Entry-level federal workers start at $34,075, or $42,209 for candidates with superior academic achievement. On the other hand, some federal blue-collar and clerical workers are paid more than those in the private sector. The ongoing debate about federal pay, however, does not address the root problem: The government does not have a pay system flexible enough to recruit the best talent and pay in accordance with the market." "The vast majority of federal workers hold white-collar professional, administrative and technical jobs, and aren't just college dropouts archiving triplicates of your tax return. Approximately 20 percent of federal workers have a master's degree, professional degree or doctorate, vs. 13 percent in the private sector. Fifty-one percent of federal employees have at least a college degree, compared with 35 percent in the private sector. Remarkably, more than 50 current or former federal employees have received Nobel Prizes. In fact, about one in four American Nobel laureates have been federal workers. Their contributions have included the eradication of polio, the mapping of the human genome and the harnessing of atomic energy. Federal employees protect our food and drug supplies, manage airline traffic, foil terrorist attacks, care for our wounded veterans, and make sure the elderly and those with disabilities get their Medicare and Social Security benefits. This is hardly paper-pushing." And finally, the Post points out that freezing our pay won't necessarily help with the budget. First, the amount saved is tiny compared with the deficit. And if they cut 200,000 jobs like the Debt Commission wants, even that could COST MORE money if the tasks performed by federal employees are contracted out. But yeah, go ahead and cut my salary so I can share in the sacrifice. I hope you'll share your bonus when the time comes. Yes, I know. And the sky is blue. Seriously, I realized in class today that our first hour of class each day is probably my favorite. Each of us comes in with our uudis, or news. Usually, it is something we have read about in the paper or online that we have written a few sentences about in Estonian. This, coupled with our warm up conversation, leads us to talk about some really interesting topics. Today we talked some about Judaism and the different holidays and their relative importance to Jewish people. We also talked about the OSCE meeting in Kazakhstan and how the capital has been relocated to Astana from Almaty. And whether Kazakhstan is in Europe or not. It is kind of fun to be able to have a conversation. Of course, we are still pretty limited in what we can say, but we finally have enough vocabulary to talk our way around the words we don't have. And doing it is a lot of fun. But we all already knew I liked to talk, right? Deputy Secretary of State James B. Steinberg will present the 2010 Associates of the American Foreign Service Worldwide Secretary of State Award for Outstanding Volunteerism Abroad to the six winners from different geographic regions at a ceremony on Thursday, December 2 at 10:00 a.m. in the Benjamin Franklin Diplomatic Reception Room at the Department of State. The awards recognize U.S. Government employees; family members, including domestic partners; and other members of household at embassies and consulates who gave exceptional volunteer service to their communities, mission or host country, or rendered outstanding assistance in emergencies. Among this year’s award winners are Mindy R. Michels and Melissa E. Schraibman, who were serving in Tirana, Albania. FS employee Schraibman and her partner Michels helped a small group of Albanian activists to create a vibrant and active lesbian, gay, bisexual, and transgender (LGBT) community in Albania where none had existed. 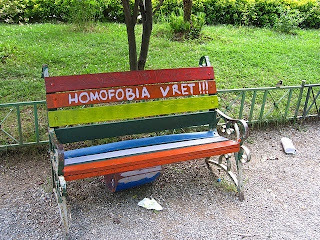 Violence and discrimination on the basis of sexual orientation was common in Albania. But through the collaborative efforts of this newly-formed group, Mindy and Melissa helped establish a grassroots organization, Alliance Against LGBT Discrimination. The couple met each week with the members of the Alliance and provided support, inspiration and skills development. They hosted strategic planning sessions for the new NGO, defining its identity, core values and mission. Over time, Melissa and Mindy trained and mentored the leadership team in grant writing, membership recruitment, press strategies, organizational development, and grassroots activism. The Alliance has succeeded in creating a social and activist network that transformed the lives of the people it reached. There are now weekly discussion groups, weekly social events, regular grassroots actions, and a very active Facebook group with over 1100 members. Mindy also participated in an ongoing working group sponsored by the Dutch Embassy on LGBT issues. As part of the group, she assisted in drafting a comprehensive non-discrimination law in Albania covering everything from discrimination on the basis of religion to discrimination on the basis of sexual orientation and gender identity. The volunteer accomplishments of Mindy and Melissa showcase what volunteer service can achieve on behalf of transformative diplomacy. You can check out an album of their photos here. This year also marks the 20th anniversary of the establishment of the SOSA awards by Secretary of State and Mrs. James Baker. To honor this milestone, the Associates of the American Foreign Service Worldwide have created an on-line publication entitled “FS Volunteers – 20 Years of Grassroots Diplomacy.” The publication documents the contributions and outstanding volunteer service provided by over 400 Foreign Service employees and family members at U.S. embassies and consulates all over the world. The publication, including a brief synopsis of the volunteer activity that earned all of this year's award winners their awards can be found at here. The award ceremony is open for press coverage. Members of the press wishing to attend should contact Public Affairs Officer Brenda Greenberg at 202-647-4282. Media representatives may attend this award ceremony upon presentation of one of the following: (1) a U.S. Government-issued identification card (Department of State, White House, Congress, Department of Defense, or Foreign Press Center), (2) a media-issued photo identification card, or (3) a letter from their employer on letterhead verifying their employment as a journalist, accompanied by an official photo identification (driver’s license or passport). Those who do not have a State Department building pass should allow adequate time to clear through security at the 23rd Street entrance. The General Services Administraiton is amending the Federal Travel Regulation (FTR) by adding terms and definitions for "Dependent," "Domestic partner," and "Domestic partnership," and by revising the definition of "Immediate family" to include "Domestic partner" and children, dependent parents, and dependent brothers and sisters of the Domestic partner as named members of the employee’s household. This interim rule also adds references to domestic partners and committed relationships, where applicable, in the FTR. It was proposed on November 2nd and comment period ends December 20th. The effective date will be March 3, 2011. Muttering Behind the Hardline has one of his best posts ever (in my opinion) with a dead-on description of what it feels like to have your cables leaked through Wikileaks. He compares it with the abused woman you tried to help only to have her abusor find out because you tried to help and have you be powerless to assist with the fallout. "You have the sickest of feelings in the pit of your stomach. It wasn’t your fault, but the weight of the responsibility you feel is crushing. You want to make it right, but how? You feel helpless, ashamed, regretful, frustrated. You’re terrified that something awful is about to happen. You hope Sarah and her kids somehow make it through, and that you find some way, any way to help in time. You feel, well, you feel like a political officer who, with the news of the Wikileaks dump, saw flash through his mind at lightning speed every confidential interview he ever did with every human rights or social activist he ever quietly met with working in a country governed by a totalitarian regime. And with 250,000+ documents out there, it’s not just possible but likely that those brave men and women he considered friends may be facing a very rough time ahead. And chances are now that he’s long gone, he will likely never know whatever became of them. Julian Assange and Bradley Manning apparently don’t have to worry about walking around with that sense of guilt. They don’t personally know the people who trusted us with their inner thoughts and secrets, hoping we might be able to help bring light to their very dark place. This is more than treason. It’s more than a leak or an information dump. For many of us, this is deeply personal."